As the old saying goes, dogs are a man’s best friend. They provide companionship and loyalty like no other animal and have been proven to enhance both physical and mental wellbeing. However, aside from being an important member of the family, dogs also play a significant role in the lives of people with disabilities. From seeing-eye dogs to seizure alert dogs, it’s astounding what a canine can learn with the correct training. Obviously, not all breeds are up to the task. A Golden-Retriever-Labrador-cross is the most suited to aid work because of its intelligence, work-ethic, and early maturity, but Poodles, Border Collies, Alsatians and Terriers have also been used. So what role do these dogs actually play and how does that vary according to the needs of their owner? Guide dogs are trained to lead people with visual impairments through their daily lives. Although they can be trained to navigate various obstacles, they are partially color blind and not capable of reading street signs. Therefore, the handler must have an idea of where they’re going, or have a companion with them who does. A hearing dog alerts their handler to important, potentially life-threatening sounds, such as doorbells, smoke alarms, ringing telephones, or alarm clocks. They also work outside of the home, warning their owners of sirens, approaching cars or people. Labradors, Golden Retrievers, English Cocker Spaniels and Poodles are the most suited to this job, although a small number of Labrador crosses and Cocker crosses may also be considered. Selection depends on the personality of the dog and whether they have a willingness to work. It might sound strange, but anyone who has owned a dog will know that they have personalities. A lazy, disinterested dog would not be suitable but there are many that relish the work and get real pleasure out of their caring role. Might sound a little anthropomorphic, but it’s true. As such, a dog that doesn’t want to work will never be forced to. Although epilepsy is the most common neurological illness, only 70% of cases can be controlled by drugs. This means that 30% of people with epilepsy are living in fear of an oncoming seizure, which can occur at any time. Seizure response dogs give between 10-55 minutes warning prior to an oncoming seizure, enabling their owner to find a place of safety. This is particularly important if the handler is in dangerous circumstances, like behind the wheel of a car. Although it is not known why some dogs can anticipate seizures, the theory is that they can smell a seizure coming about 30 minutes in advanced. Not all response dogs will develop this skill, but those who don’t still play a vital role. As the video shows below, they can help to rouse a handler from a seizure, bring them medication and protect them whilst they wait for help. An autism support dog plays a very different role compared to the other dogs we have mentioned. For a child with autism, life can be alienating. Their world is a mass of pictures and sounds that don’t make sense and this can cause destructive, compulsive or ritualistic behaviour. As such, rather than assisting with day-to-day tasks, an autism support dog provides emotional aid. Dogs are characterised by their simple and consistent communication methods. They are loyal and thrive on routine, making a child with autism feel secure in stressful circumstances. They also provide a strong sense of companionship, which is familiar and reassuring in new environments. Mobility assistance dogs are perhaps the most active of the aid dogs in that they have lots of different, quite human responsibilities. They are most suited to people with upper-body mobility issues who use a wheelchair and perhaps don’t have full use of their arms or hands. Mobility dogs can open and close doors, press buttons and switches, unload a washing machine and even help you get dressed. They are paramount to the sense of independence a person with a disability can achieve, as the video shows below. Dogs are renowned for their sense of smell and for centuries, doctors have been aware of the characteristic odours of disease. Therefore, in a similar way to seizure response dogs, cancer detection dogs alert professionals to the odour of human disease – enabling scientists to develop early cancer screening systems. Their ability isn’t only restricted to cancer either. Medical alert assistance dogs are trained to assist individuals who manage complex medical conditions on a day to day basis. They are taught to identify the odour changes associated with certain medical events – such as insulin levels in diabetic people. So there you have it, dogs are not only a man’s best friend, they are intelligent, hard-working and dedicated creatures that can make a significant difference to people’s lives. 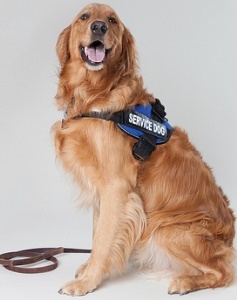 Do you have a service dog or is it something you would consider? Share your stories below.